Dubai: UAE drivers have been warned once again against overspeeding on major highways following a couple of road crashes between Dubai and Sharjah in less than 12 hours. Between Wednesday night and Monday morning, two highway collisions occurred, prompting authorities to warn motorists not to speed well over the limit. The Dubai Police reported at 6:35 am that a multi-vehicle accident obstructed traffic near the Dubai International airport. The vehicles from Sharjah were traversing on Beirut St. and moving towards the direction of the airport tunnel. Just a few hours earlier, around 11pm on Wednesday, an accident between two vehicles occurred on the Sharjah-bound lane of Shaikh Mohammad Bin Zayed Road, just after the MCC bridge. Driving at excessive speeds, coupled with changing lanes too quickly, has been cited as one of the major causes of horrible mishaps. “Driving at high speeds causes the most serious traffic accidents. 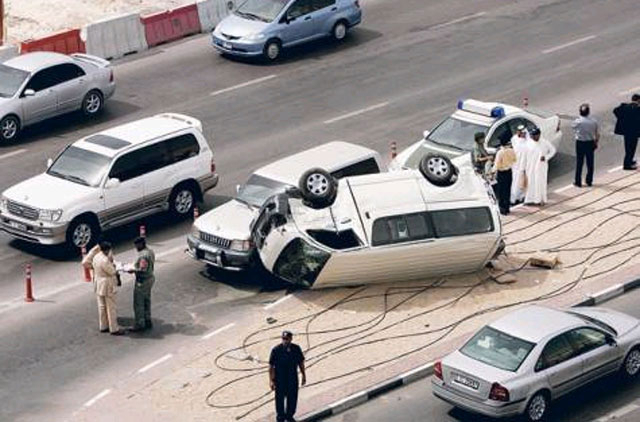 We advise you to adhere to the legal speed limits,” the Dubai Police said on Twitter. Speeding isn’t just dangerous, it can be very costly. The UAE federal traffic law states that drivers face a fine of Dh600 for exceeding the speed limit by 30 kilometres per hour, Dh700 for speeding by 40 kilometres per hour and Dh1,000 if they exceed the limit by 50 kilometres per hour. Just last year, a tourist in Dubai racked up Dh170,000 in traffic fines in under four hours. The visitor was driving fast on Shaikh Zayed Road in a rented Lamborghini and tripped at least 33 speed radars.